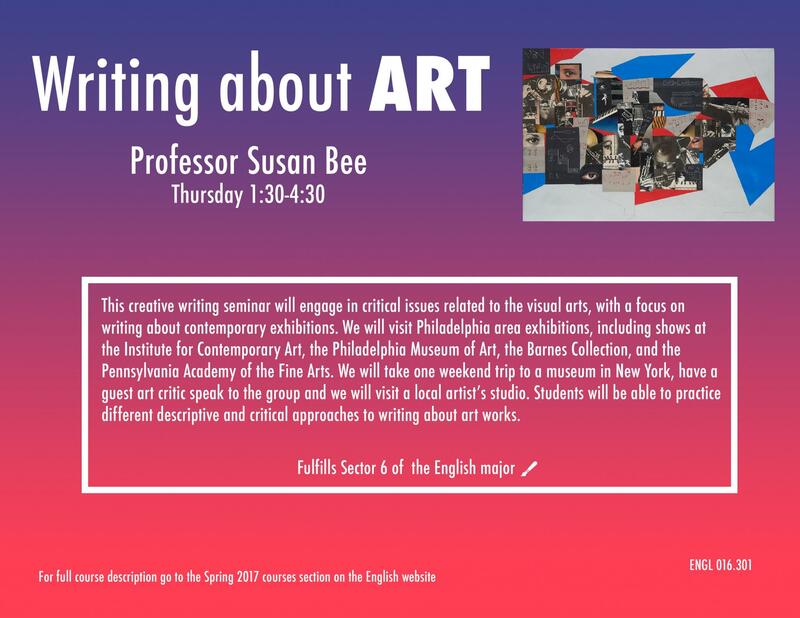 This first-year creative writing seminar will engage in critical issues related to the visual arts, with a focus on writing about contemporary exhibitions. Members of the seminar will visit and review Philadelphia area exhibitions, including shows at the Institute for Contemporary Art, the Philadelphia Museum of Art, the Barnes Collection, and the Pennsylvania Academy of the Fine Arts. In addition, we will take one weekend trip to a museum in New York. We will also have a guest art critic speak to the group and we will visit a local artist’s studio. In the seminar, students will be able to practice different descriptive and critical approaches to writing about art works. There will be ample time given to in-depth discussions of a wide range of contemporary visual art.